El Charco (natural pool in Spanish) prides itself on featuring almost entirely the native flora of the Sierra Madre. 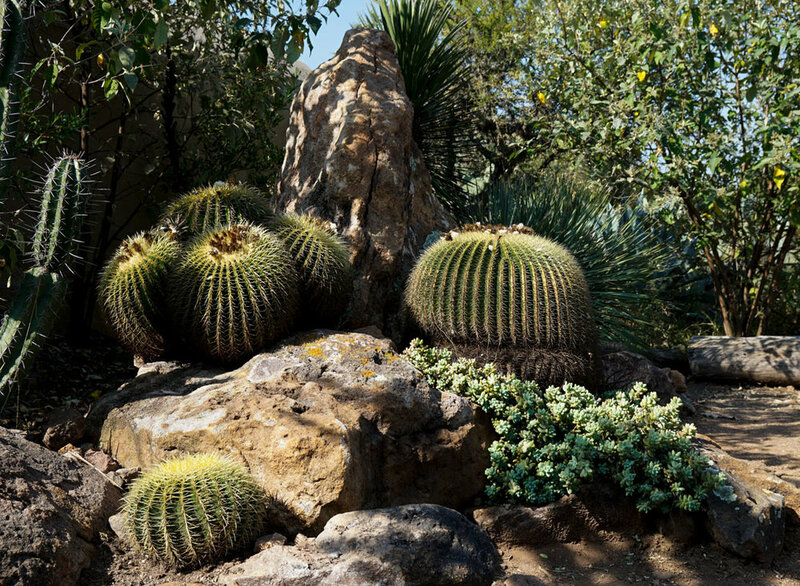 For over two decades, it has amassed an impressive collection of cacti, agaves, yuccas and other succulents, some of which are rare and found solely in the Conservatory. Both a botanical garden and a nature reserve totaling 167 acres, it is set in a dramatic topography: a high plateau overlooking a deep and rocky canyon with broad sweeping views of the Bajio mountains beyond. Its presa — a man-made dam with small island “outcroppings”, is a draw to both seasonal and year around birds—as well as bird watchers. Just over the presa’s bridge with its view to the north of the canyon below, await trails bordered by sweeps of golden grasses. And, if you’re lucky, you might even catch sight of seemingly choreographed cowbird murmurations at sunset that will take your breath away. Less of a hazard and more inviting to approach are another type of succulent: the small, delicate Echeveria or stonecrops such as sedums which I also appreciate in my garden in New England. Here, they also offer a wonderful ground cover with the added advantage: a visually softening to a landscape punctuated by architectural cacti, agaves, yuccas and sotol palms (Dasyliron). And, while one may miss seeing the majestic Joshua tree yucca, San Miguel’s central highlands offer the tree-like Yucca filifera with its thin sword-shaped leaves and rosettes. 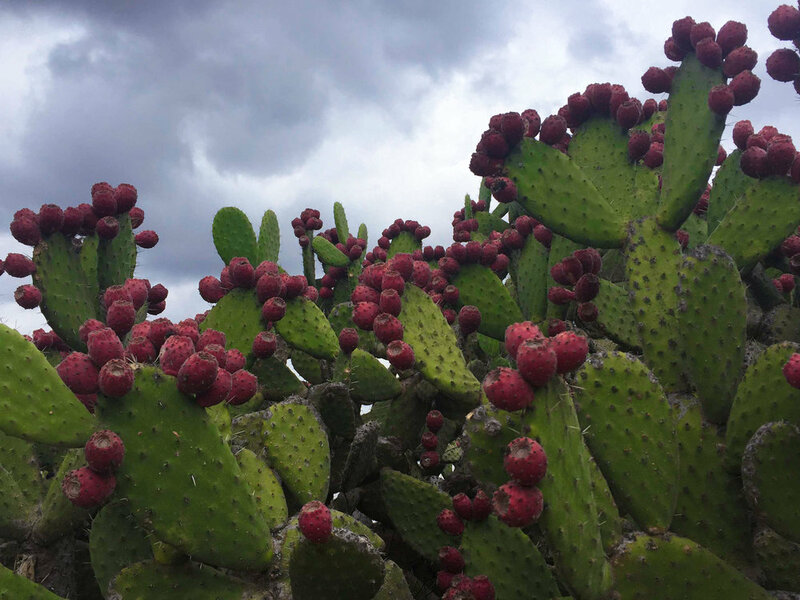 Be it in the more tamed garden, the canyon or the grassy hillside, the cactus, Opuntia, or in Nahuatl, nopales, with their coral red as well as yellow edible fruits called “tunas”, or prickly pear, makes for a star of the show. Its versatile culinary uses include a tasty liqueur, dried fruit and yummy marmalades sold in the Charco’s store. In town, the nopal “paddles” are commonly found prepared in restaurants, or the mercado where you see seated women painstakingly scraping off their spines i.e. thorns. And how could El Charco not be a nature photographer’s paradise? Drylands, blue sky, water, flora and fauna beckon. More recently, I am drawn towards capturing with my lens the sensual, sculptural forms of the Agave or maguey in Spanish but originally Taino. Also dubbed the “century plant”, it was incorrectly purported to take a century to flower. However, a certain poignancy remains: it dies after its stately asparagus-like stalk has finally flowered. But things are not over: the fibers made from its leaves are used for ropes and its needles for sewing are ever so durable. Emerald green, blue, or sporting golden stripes, depending upon which of its over 160 species, makes it not only smooth to the touch but also to the palette. Agua miel, pulque, tequila or mescal, these make for yet another Mesoamerican gift to the world that will enchant for centuries to come. And now in contrast with the desert plants is the water on a late November day: the presa or dam that gives provides a habitat to waterfowl. Here small islands have grasses and trees that provide perfect cover.